This entry was posted on October 21, 2016 by Kailey. Jony Ive’s smooth narration introduced Apple users to the glossiest iPhone on the market. Apple merged science and art with the innovative design of the Jet Black color option for iPhone 7 and 7 Plus. Yet, with it, came the news that the jet black edition attracted scratches far quicker than the other options. With that in mind, we've curated products, tips, and tricks to protect the glossy shine of your jet black iPhone 7 and iPhone 7 Plus and keep it clean. The jet black iPhone 7 and iPhone 7 Plus is sleek and elegant with a mirror-like shine to it. It is a color option modern fashion gurus and Batman both can love. With initial limited production, the jet black iPhone 7/7+ was the first to sell out. While Apple is still perfecting the jet black iPhone, it’s representative of the artful engineering that Apple prides itself on. iPhone users were left with a choice. Either pick the stylish and gorgeous design of the jet black iPhone or go with one of the other colors. You could almost hear the rose gold iPhones cheering. However not all hope is lost when it comes to the brilliantly designed iPhone's jet black finish staying pristine. The release of the new iPhone has opened up the market for products to protect the jet black shine. Durable cases are your best bet for keeping the iPhone's jet black finish unscratched. However, the smooth finish can easily attract fingerprints and other smudges just as quickly. Luckily, cleaning the jet black iPhone is a breeze. But first, remember when cleaning your jet black iPhone is to never use any caustic liquids! This includes alcohol pads, disinfectants (like Lysol or Windex) or any non-smartphone approved liquid. The unique design of the jet black finish means any sort of caustic liquid will begin to quickly degrade the finish. Unlike iPhones before it, the jet black finish goes through an anodization process that leaves it susceptible to most regular cleaning agents. Instead, your best bet is a little bit of water and a microfiber cloth. Fingerprints, oils and the like don’t stand a chance against this simple technique. These microfiber cloths from Amazon are designed specifically for your smartphone and small enough to pack away in your wallet, briefcase or purse. If you are looking for a way to kill the nasty germs and bugs hiding out on your phone these screen wipes from Zeiss are your best bet for safely cleaning your iPhone. Free of ammonia and alcohol, they won’t degrade the quality of your jet black iPhone and will clear out most germs and smudges. With the killing of the headphone jack, there’s one less port to worry about getting clogged up in your iPhone 7 , however, if your lightning port does become clogged with debris or dirt, CNET recommends using a simple toothpick. Or if you are feeling fancy, you can splurge on an OXO Good Grips Electronics Cleaning Brush to assist in all your cleaning needs. It can easily reach hard to spot places, and you are less likely to jam a piece of sand further into the port. Even after your wipes, cloths and brushes feel like not quite the right fit, the iRoller is a great little tool that quickly cleans your iPhone by swiping along the screen, removing fingerprints and bacteria. Cleaning is vital to maintaining the luster of the jet black iPhone. Next, a case can assist in avoiding scratches and dings and micro-abraisions from pocket lint and random stray dust particles in the air. The cases highlighted here still let you show off the jet black finish while keeping your iPhone safe and sound. Sahara Case has created a protective screen for both the front and back of your iPhone 7/7+, filling in the gap left behind by other protective shield companies. With tempered glass, a built-in camera hood to protect the lens, and, easy installation the Sahara Case Protective Bundle for iPhone 7/7+ offers simple protection with no fuss. While your phone won’t likely survive being run over by a truck or dropped from a roller-coaster, screen protectors like this offer protection from the general knicks and bumps of daily use. One important note to remember about the iPhone skin that comes with this package is reports of skins peeling off all the written decals on the jet black iPhone back. While the case itself will offer plenty of protection, if you like the Apple logo on the back of your iPhone, hold off on attaching the screen to the back of your phone and simply use the case alone. If you are looking for a tough case that is still slim enough to feel invisible, Spigen offers the Spigen Ultra Hybrid iPhone 7 Case with Air Cushion Technology and Hybrid Drop Protection for iPhone 7 protects from falls and is designed specifically for the iPhone 7/7+ jet black edition. 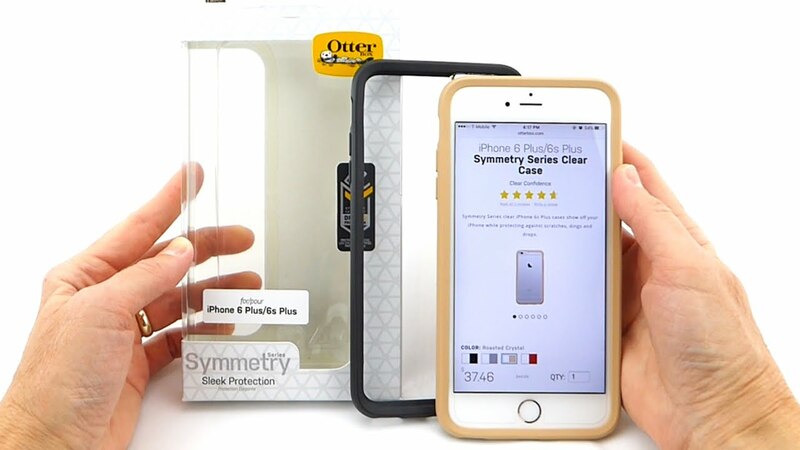 While many cases offer general protection from scratches, Otterbox is known for creating cases that even a sledgehammer couldn't crack. They’ve crafted the Symmetry Clear Case for iPhone 7/7+ that offers strong protection while still showing off the jet black finish. Early reports say the glass can have a slight fogginess, but for the protection offered it is your best bet for keeping your phone secure. The jet black iPhone 7/7+ is not a phone for everyone. While the lustrous finish is groundbreaking, it also comes with responsibilities the other iPhones do not have. However, with careful care, the rewarding elegance of the jet black finish is worth the effort. If you are looking for a hassle-free phone, the cons of the jet black should be enough to dissuade you. But, with a little extra work, the payoff is considerable. This entry was posted in iPhone and tagged iPhone care, iPhone cleaning, iPhone 7/7+, iPhone, iPhone Cases, screen protectors, Apple on October 21, 2016 by Kailey. Nice information iphones back covers. I like Spigen Ultra Hybrid iPhone 7/7+ Case. I have a Jet Black 7 Plus, and I constantly clean it with a microfiber cloth. Also, I have a Apple silicone case. But I still am getting little microabrations. Sometimes I take it out to see it's beautiy, but I NEVER set it on hard surfaces. I also take very good care of my phones. Hi! I could have sworn I’ve visited this blog before but after browsing through a few of the posts I realized it’s new to me. Nonetheless, I’m certainly pleased I discovered it and I’ll be bookmarking it and checking back regularly! What about the transparent covering on the whole phone or the onyx coating which prevents from the black shine to die and tends to make the surface anti-scratch?